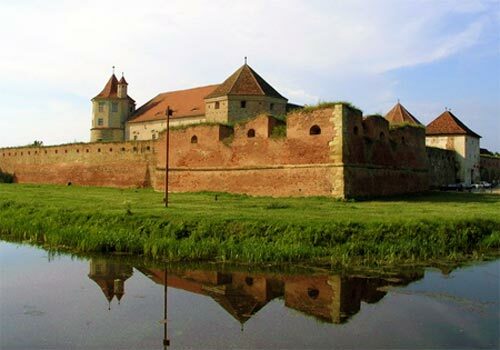 Built in the 15th century on the ruins of a wooden construction, in the South Eastern Part of Transylvania, the Fagaras stronghold had great importance in defending the region in the medieval times. 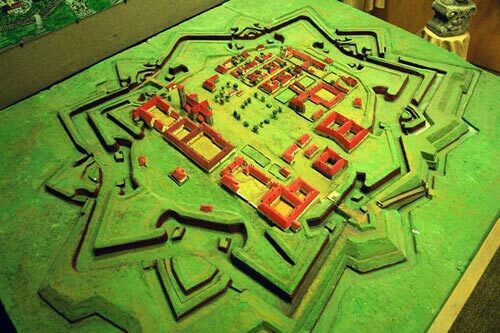 Fagaras Fortress and Castle were wholly built in brick. At present, the castle has 80 rooms, and the fortress is still surrounded by a moat which is deep and wide. At times of war or social unrest in the area, the moat could easily fill with water from a mountain brook nearby, whose course had been specially deviated to this purpose. The citadel was ranked among the strongest in Transylvania, standing in the way of Turkish and Tartar invasions. Its massive walls, towers and tall roofs are arranged in the shape of a trapezium with four corners provided with four large bastions. Access is made through a bridge over the defence moat. At the centre of the citadel stands the castle. It has three levels, i.e. basement, ground floor, first floor and five towers, i.e. the Red Tower, the Black Tower, the Prison's Tower, Tomori Tower and the Motley Tower. Alba Iulia city is located on the Mures River. Between 1541 and 1690 it was the capital of the Principality of Transylvania. The city is historically important for both Romanians and Hungarians. The main historical area of Alba Iulia is the upper city, developed extensively by Charles VI of the Holy Roman Empire, in honour of whom the Habsburgs renamed the city Karlsburg. The upper city's fortress, with seven bastions in a stellar shape, was constructed between 1716 and 1735 by Giovanni Morando Visconti, using the Vauban system - the largest of this kind in south-eastern Europe. Inside the fortress is the Roman Catholic Cathedral (the most representative building for the Medieval Gothic style in Transylvania), the Batthyaneum library, the Roman Catholic Bishop's palace, the Orthodox Cathedral, Babylon Building (National Museum of Unification), Union Hall, Apor Palace, the Princely Palace, and the University of Alba Iulia. 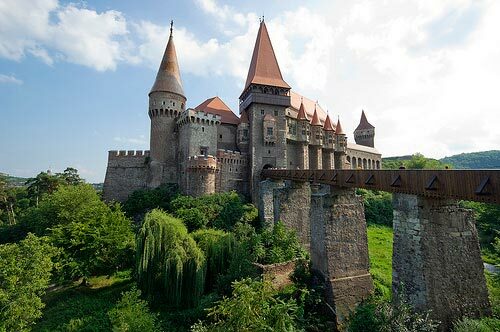 The city of Hunedoara has the most important Gothic-style secular building in Transylvania: Hunyad Castle, which is closely connected with the Hunyadi family. It is believed to be the place where Vlad III of Wallachia (commonly known as Vlad the Impaler) was held prisoner for 7 years after he was deposed in 1462. The castle is a relic of the Hunyadi dynasty. 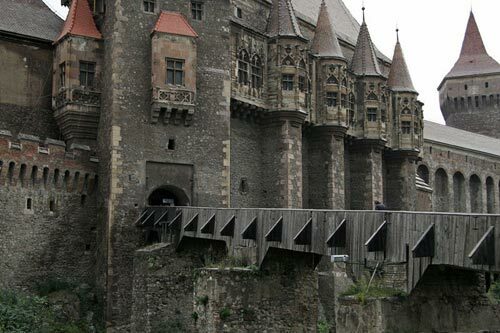 In the 14th century, the castle was given to John Hunyadi Serb by Sigismund king of Hungary as severance. The castle was restored between 1446 and 1453 by his grandson John Hunyadi. It was built mainly in Gothic style, but has Renaissance architectural elements. It features tall and strong defense towers, an interior yard and a drawbridge. Built over the site of an older fortification and on a rock above the small river Zlasti, the castle is a large and imposing building with tall and diversely colored roofs, towers and myriad windows and balconies adorned with stone carvings. In the castle yard, near the chapel built also during Vlad The Third's ruling, is a well 30 meters deep. The legend says that this fountain was dug by twelve Turkish prisoners to whom liberty was promised if they reached water. After 15 years they completed the well, but their captors did not keep their promise. It is said that the inscription on a wall of the well means "you have water, but not soul". Specialists, however, have translated the inscription as "he who wrote this inscription is Hasan, who lives as slave of the giaours, in the fortress near the church". In February 2007, Hunyad Castle played host to the British paranormal television program "Most Haunted Live!" for a three-night live investigation into the spirits reported to be haunting the castle. Results were inconclusive.